Michael Kolowich is a recognized pioneer and innovator in internet content, high-technology marketing, and the application of digital video technology. He is currently CEO of KnowledgeVision Systems, an online presentation software and services company which he founded in 2010, and president and executive producer of DigiNovations Incorporated, a media production company which he founded in late 2001. During the 2008 presidential election campaign, he was architect and producer of “Mitt TV”, the acclaimed video website for the Mitt Romney Presidential Campaign. 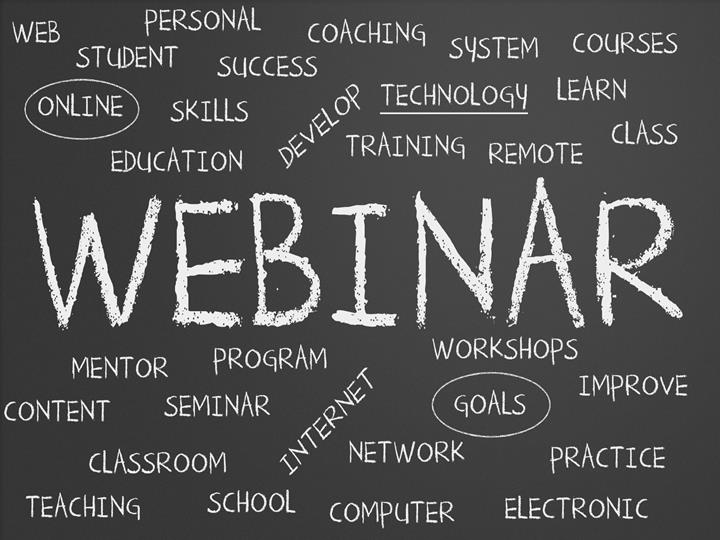 Kolowich recently proposed that marketers “Flip the Webinar.” And he’s already experimented with the “flipped webinar” format with Training Magazine Network. I interviewed Kolowich about his core concept and his choice of YouTube and Google Plus Hangouts On Air for his experiment. Jarboe: What are the problems with the traditional webinar? 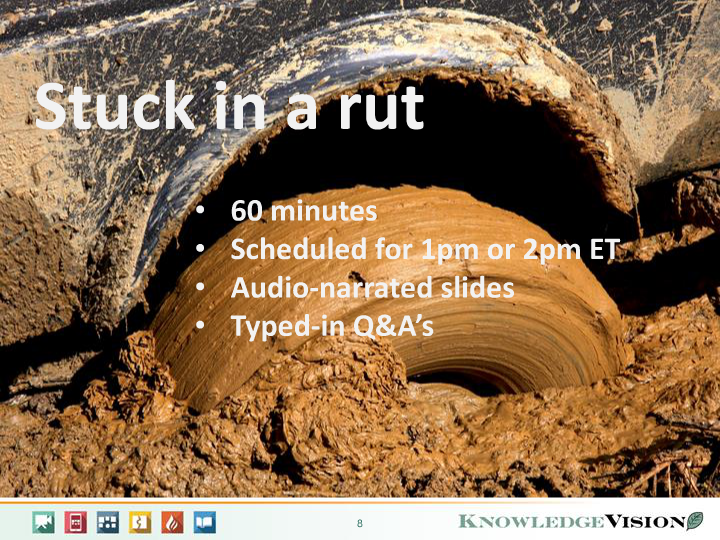 Kolowich: The traditional webinar format is getting tired — it’s stuck in a rut, and badly in need of a makeover. What makes me say that? Some of the most prolific webinar producers admit that webinar sign-ups and attendance are going down slowly but steadily over time. They feel lucky if they can get 40% who signed up for a webinar to attend, and the typical attendance is closer to 30%. I think webinars have three basic problems: a personality problem, a schedule problem, and an engagement problem. The personality problem comes from the fact that most webinars consist of disembodied voices narrating PowerPoint slides. That’s not how we’re wired as human beings to absorb knowledge from subject-matter experts. Gestures, facial expressions, and props are all part of how people communicate, and yet because of the complexities of live video, most webinar producers dismiss presenter video as too risky and complicated. The schedule problem comes from the fact that when you find out about most webinars, they’re 2-3 weeks in the future. But as a marketer, you’ve got their attention now! Why not deliver the content now? Why make people wait three weeks? Chances are that no matter how well-intentioned a prospective webinar attendee is, some other meeting will come up in that time slot, and they won’t attend. And who says 60 minutes is the right amount of time to deliver every subject? The engagement problem comes from the fact that most webinars don’t spend enough time on interacting with the speaker, simply because so much of the live webinar time is spent presenting the core material. 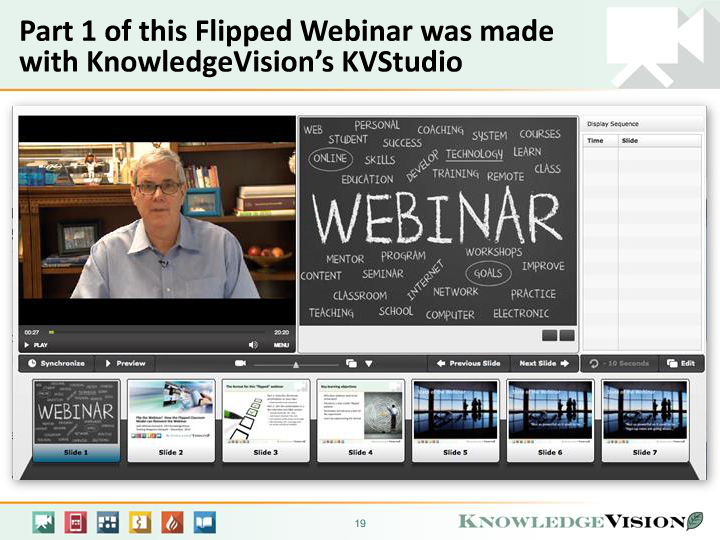 Jarboe: Why is the Flipped Classroom the right model for flipping the webinar? Kolowich: The “flipped classroom” model comes from education, and the concept is simple: instead of using valuable classroom time watching the professor lecture with slides, why not distribute the lecture in advance on video, and then spend that valuable time together in Q&A, group exercises, and the like? Places like Harvard Business School have been practicing this for decades with the case method, but now this “flipped” format is catching on in all kinds of classrooms. That same kind of model can help reinvent and reinvigorate the webinar: by distributing the presentation material in advance (in a much richer multimedia format), you can have an even livelier interactive session later on. Jarboe: How do you Flip the Webinar? 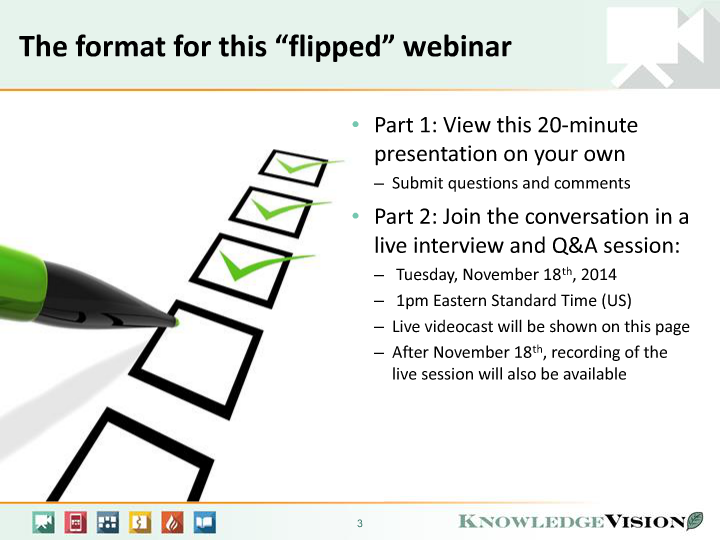 Kolowich: You “flip” a webinar by dividing it into two parts. The first part is a pre-recorded online presentation of the speaker’s main thesis. We like to do this with KnowledgeVision, which synchronizes video with slides, footnotes and virtual handouts and measures viewer dynamics. It also collects questions from viewers as they watch the material. This is immediately available the moment someone signs up for the webinar. The second part is a live session that has the feel of a call-in talk show. A host and the webinar speaker handle questions from the viewers, can conduct polls and interactive exercises, and use as much as an hour to explore a subject much more dynamically than the normal webinar. 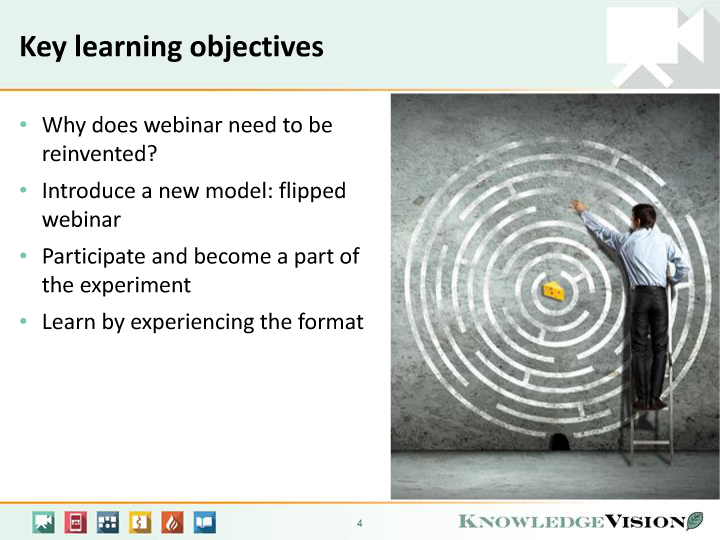 Jarboe: How does KnowledgeVision help you build the on-demand session? Kolowich: When you’re pre-recording Part One of the webinar, you can use much richer multimedia tools than you would for a live webinar. In particular, video is much easier to produce for on-demand use than for live webcasts. You can divide the material into chapters to make it easy for viewers to see where you’re taking them, and so they can easily hop back to things they want to review. You can put reference links in to help viewers explore “sidebar” material more fully. You can even put transcripts in to help the hearing impaired or non-native speakers of the language. Those are the kinds of features that KnowledgeVision was built for — to build rich media experiences. Jarboe: Why did you choose YouTube and Google Plus Hangouts on Air to host the live session? Kolowich: Let’s face it: YouTube is a universally accessible and accepted video streaming platform. Is there a person in our potential webinar audiences who hasn’t viewed a YouTube video? Google Plus Hangouts On Air is a great way to put a host and guest together into a YouTube video stream for the live session of a flipped webinar, even if they aren’t in the same location. I’ve done sessions where the host is in Hawaii and the two speakers are in Pennsylvania and Massachusetts. It’s not studio-quality HD video, but it’s very acceptable for a webinar. And Hangouts On Air also allows you to invite viewers in to participate in the questions. And did I mention it’s free? Jarboe: The SEM Post interviewed Vinja Video’s Kent Libbey a couple months ago. Do you think that Vinja’s chaptering function makes it easy to identify and tag key elements of any YouTube video, while maintaining the continuity of the whole, would add value to Part Two of “Flip the Webinar,” which is posted on your website? Kolowich: It turns out that the live portion of a flipped webinar, despite its attractiveness as an interactive experience, is still viewed by more on-demand viewers over time than the number that view it live. Being able to add chapters and tags to the Q&A session allows viewers to go right to the topics that most interest them, rather than wading through an hour-long recording with no structure. Any long-format video needs structure: otherwise, viewers spend far too much time scrubbing their way through a video to find “the good parts”. Vinja appears to be a great solution to adding structure to what would otherwise be an amorphous video program.